15.8 lakh air tickets were booked online and 47.2 lakh online bookings for Railway tickets were made on IRCTC website in October 2012, according to data from the Internet & Mobile Association of India’s (IAMAI) Internet Economy Watch Report for October 2012. On a year on year basis, e-commerce activity across various platforms including ticketing, e-tailing, job portals and online matrimonial websites showed healthy growth levels. 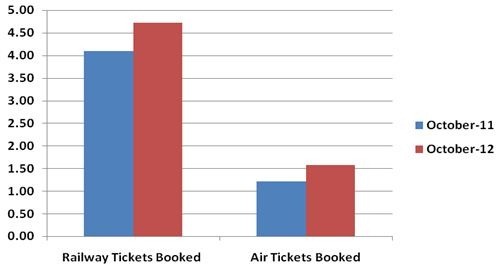 The number of air tickets booked online in October 2012 increased nearly 30.6% over October 2011 but were down 17.7% from April 2012. IAMAI’s report for April 2012 showed that 19.2 lakh air tickets were booked online. Activity on Indian Railways’ irctc.com witnessed a growth of 15.1%. 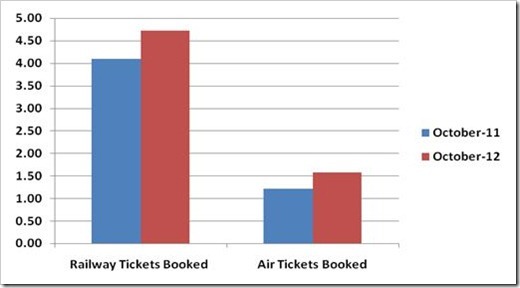 Nearly 6.2 lakh more tickets were booked on the website in October 2012 as compared to the same time last year. Similar to the air ticketing segment, online booking activity on irctc.com was down by about 15% as compared to 55.6 lakh bookings in April 2012, a period 6 months prior to October 2012. ASSOCHAM’s report on e-commerce in India revealed that SBI, ICICI and HDFC were the top 3 most preferred banks for direct debit payments on irctc.com. 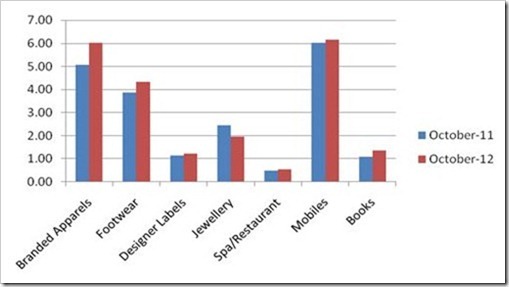 Activity on prominent e-tailing websites witnessed growth in all segments except Jewellery, which declined 20.4%. Among other segments, nearly 60 lakh users online made their way to Branded Apparels and a similar number of users engaged with e-tailing websites for Mobiles. 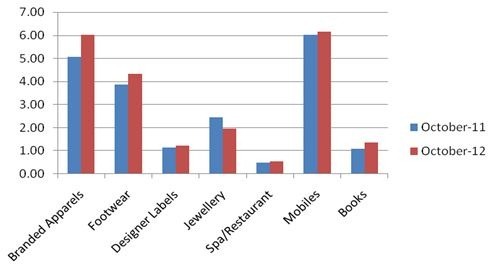 According to IAMAI’s report, Branded Apparel and Mobiles emerged to be the most visited segments in the e-tailing domain in India. 43 lakh users engaged with the footwear segment while about 13 lakh visited e-tailers for Books, a segment in which activity grew 26% as compared to October 2011. It was recently in the news that Flipkart launched eBooks for download on Flyte, its digital product platform. A dedicated android app would allow users to preview, purchase, download and read eBooks from their mobile devices. Recent trends suggest that apps and mobile internet have been seen as access points by e-tailers and popular online travel portals to tap into a growing online consumer base. The Indian mobile subscriber base has seen consolidation in recent months. However the continued uptick in smartphone users and other mobile devices including tablets with connectivity, is likely to drive higher levels of growth across most online domains. 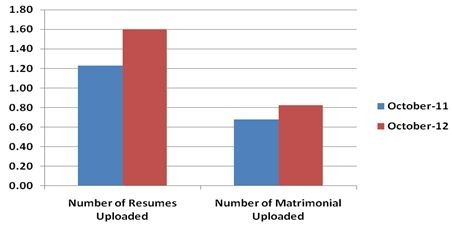 30.1% more job seekers found their way online as 16 lakh resumes were uploaded in October 2012, 3.7 lakh higher than the same time last year. 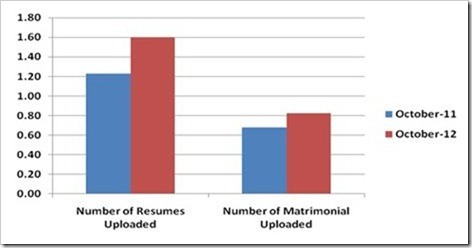 Activity on matrimonial websites was also up 20.6% from 6.8 lakh profile uploads in October 2011 to 8.2 lakh this year.